Such a hot and smoldering edition to the mix. Presenting Bloodlines #3 The Indigo Spell by Richelle Mead. In the aftermath of a forbidden moment that rocked Sydney to her core, she finds herself struggling to draw the line between her Alchemist teachings and what her heart is urging her to do. Then she meets alluring, rebellious Marcus Finch--a former Alchemist who escaped against all odds, and is now on the run. Marcus wants to teach Sydney the secrets he claims the Alchemists are hiding from her. But as he pushes her to rebel against the people who raised her, Sydney finds that breaking free is harder than she thought. There is an old and mysterious magic rooted deeply within her. And as she searches for an evil magic user targeting powerful young witches, she realizes that her only hope is to embrace her magical blood--or else she might be next. Populated with new faces as well as familiar ones, the Bloodlines series explores all the friendship, romance, battles, and betrayals that made the #1 New York Times bestselling Vampire Academy series so addictive—this time in a part-vampire, part-human setting where the stakes are even higher and everyone’s out for blood. Oh my God! Oh my God! Oh my God...... The Golden Lily ended with the shocking and heart breaking ending but MAN does it bounce back with THE INDIGO SPELL with a full bloom. There is drama, there is shocking unraveling of secrets and conspiracies, some intense spell work and an even more intense and heated romance enough to leave us tingly all over. We meet a lot of new characters this time with the oldies coming in with full swagger. Marcus Finch the mysterious renegade alchemist, somehow he didn't impress me much. Sure he is good looking, has his priorities in order a bit, knows what he wants and why he wants it but he did not appear to be much of a man of action. He is charming, got some mad talking skills but didn't seem to impress Sydney or even for that matter me. Sydney! Sydney! She has considerably changed a lot since we have seen her in the Vampire Academy series till date to this book. There is a significant change in her character that I really liked. The Sydney of back then would have never have been companionable with Moroi or Dhampir's would be downright professional and keeping distance with the group she must help. But she is adjusting to her surroundings, actually taking an interest of those around her and participating and maintaining a healthy conversation and companionship to aforementioned group. The staunch Alchemist teachings are still there, it will be long time before she can actually leave that notion behind that everything is black and white(because the gray is always there). The plot, the new twists, the drama, the seduction and all the new elements, magical practices and..... HOPPER made it even better and a perfect specimen of an advancing plotline. I liked how the various arks joined into a powerhouse of a book that is The Indigo Spell. It goes to mettle of the author for successful creation a book worth cherished and I finally understand what the next book title, The Fiery Heart means...... excited. 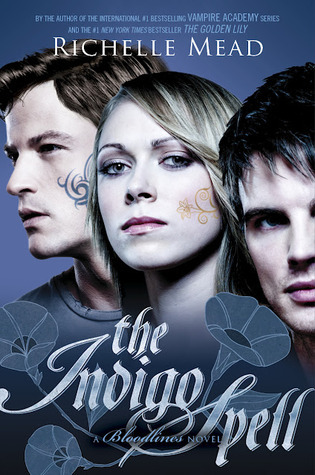 "Love, Hate, Truth, Secrets and some cool use of magic...... a formula that makes Richelle Mead's THE INDIGO SPELL cast a spell on all us readers"